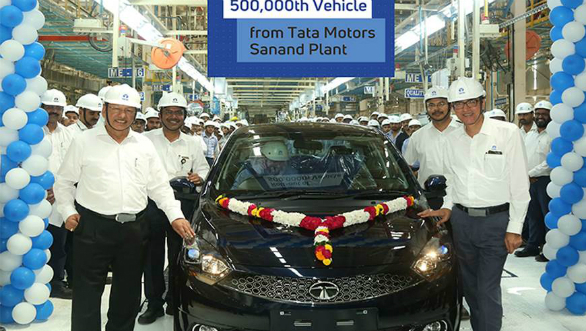 Tata Motors has announced that its Sanand plant has crossed the 500,000 unit production mark in October. The plant is currently working at its full capacity of 1,54,000 units per annum. Spread across 1,100 acres, the Tata Motors' Sanand facility started with the Nano in 2010 and presently has multiple models such as the Nano, Tiago and the Tigor models spread across 21 variants with 150 vehicle combinations. Additionally, it also produces Revotron 1.2L ? petrol (manual and automatic), Revotorq 1.05L ? diesel, 624cc, MPFI ? petrol (manual and auto transmission) and 1.2 NGTC ? petrol (manual and auto transmission). The Sanand facility is considered as one of the most technologically advanced plants. Speaking about the achievement, Tata Motors' president of the passenger vehicle business, Mayank Pareek said that Tata Motors has been working aggressively towards their core strategy of Turnaround 2.0, aiming to 'Win sustainably in PVs'. A lean manufacturing process plays a key role in this strategy enabling the Sanand plant to contribute around 60 per cent of the overall PV production. They are extremely proud of achieving this milestone within the planned timeline. He called this the result of the hard work put in by their dedicated workforce. The plant has evolved to become a modern, state-of-the-art facility and is playing a pivotal role in meeting aspirations of Tiago and Tigor customers.